Tibet, the roof of the world, is a land of dramatic mountain ranges, stark open plains, and a truly unique culture and people group. The historical region in the southwest of China, lay largely undiscovered by outsiders until the beginning of the 20th century, but has since captured the worlds' imagination, where fascinated travellers seeking the unspoilt and more remote corners of the globe. China invaded and annexed Tibet in 1950, and the country has since officially been known as the Tibet Autonomous Region. Travelling through Tibet is sadly no longer permitted unless visitors are part of an organised tour booked through an authorised tour operator. However, those who prefer to travel outside of big groups can still be granted permits so long as they have a guide and an itinerary booked through their tour operator. Travellers must be careful to remain with their tour guide for the duration of their stay. Luckily, tours of Tibet are plentiful and varied and itineraries can be arranged according to individual preference, but travellers should bear in mind that China occasionally suspends travel permits to Tibet due to political tension. In recent years, there has been a massive influx of Han-Chinese immigrants to Tibet, and Chinese-Tibetan relations can be strained at times, but Tibetan locals are famously friendly and hospitable to foreign visitors. The vast Tibetan territory consists of a massive plateau surrounded by towering mountain ranges: the Himalayas to the south; the Karakoram to the west; the Kunlun to the north; and smaller ranges fringe the east, forming a barrier between Tibet and China's internal provinces. Most of Tibet is several thousand feet above sea level, meaning that the air is thin. The region is a major draw for mountaineers, containing some of the world's highest and most picturesque mountain peaks, capped by Mount Everest at 29,029 feet (8,848m), in the Himalayas of Tibet's Tingri Country. Tibet is unbelievably scenic, with towering snow-covered peaks, glaciated high passes, aquamarine lakes, primeval forests, and piercingly blue skies. Despite its altitude and the thick snow and ice covering the mountains, Tibet actually has snowfall only a few times each year, with plenty of sunshine the rest of the time. Tibet's major cities and towns are congregated mainly in the southern part of the region. 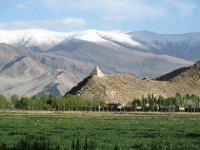 Here, in the agricultural sector, are the capital Lhasa and the other major city of Shigatse, which offer the region's most well-known tourist attractions, including the Summer Palace of the Dalai Lama and the Rongbuk Monastery, which is the highest in the world and has fantastic views of Mount Everest.